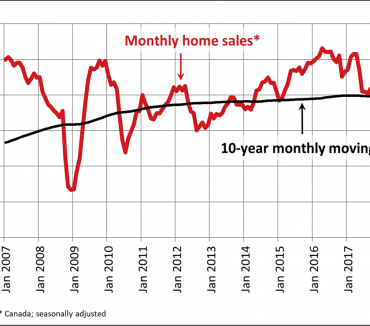 Ottawa, ON, June 15, 2017 – The Canadian Real Estate Association (CREA) has updated its forecast for home sales activity via the Multiple Listing Service® (MLS®) Systems of Canadian real estate Boards and Associations in 2017 and 2018. Housing market trends continue to diverge considerably among regions along four general themes: British Columbia, the Greater Golden Horseshoe, oil and natural resource dependent provinces, and everywhere else. In British Columbia, activity is showing early signs of recovering from last year’s correction in some areas of the province. 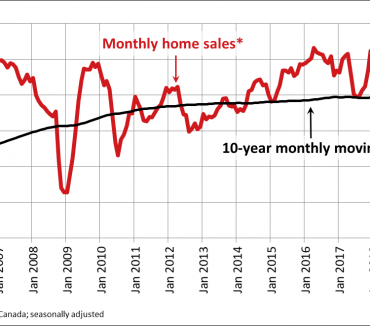 This suggests home buying sentiment may be starting to improve. In Ontario, evidence suggests that housing market sentiment has similarly cooled following housing policy changes made by the provincial government in April 2017. Trends for the province are softening, with home sales and price growth in the Greater Golden Horseshoe region slowing. Sales activity is still running at lower levels, and supply remains elevated, in the natural resource-intensive provinces of Alberta, Saskatchewan, and Newfoundland and Labrador. This has resulted in somewhat softer price trends in the two western provinces and more pronounced price declines in Newfoundland and Labrador. 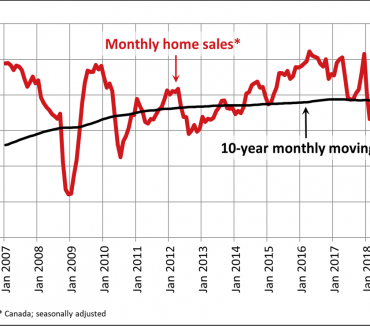 Even so, activity in Alberta has firmed up compared to the low reached in early 2016 and the balance between supply and demand in the province has been tightening. By comparison, the balance between supply and demand in Saskatchewan and Newfoundland is increasingly favouring buyers. To varying degrees, housing markets in Manitoba, Northern and Eastern Ontario, Quebec, New Brunswick, Nova Scotia and Prince Edward Island had a breakout year in 2016, with rising sales drawing down previously elevated levels of supply. So far this year, more balanced market conditions have remained in all of these regions. Access to financing and affordability for potential home buyers has been reduced by tighter federal regulations announced late last year, together with recent increases in mortgage default insurance premiums and changes to Ontario housing policies. With little more than a month having passed since the provincial changes were announced and implemented, the combined impact of policy changes on home buyer and seller sentiment, sales, listings, and the balance between the two pose potential upside and downside forecast risks. Nationally, sales activity is forecast to decline by 1.5% to 527,400 units in 2017. This is little changed compared to CREA’s previous forecast at the national level, with an upward revision to the sales forecast for British Columbia offsetting a downward revision to Ontario’s. Sales in British Columbia are still forecast to decline in 2017 compared to the all-time record in 2016 (-9%). 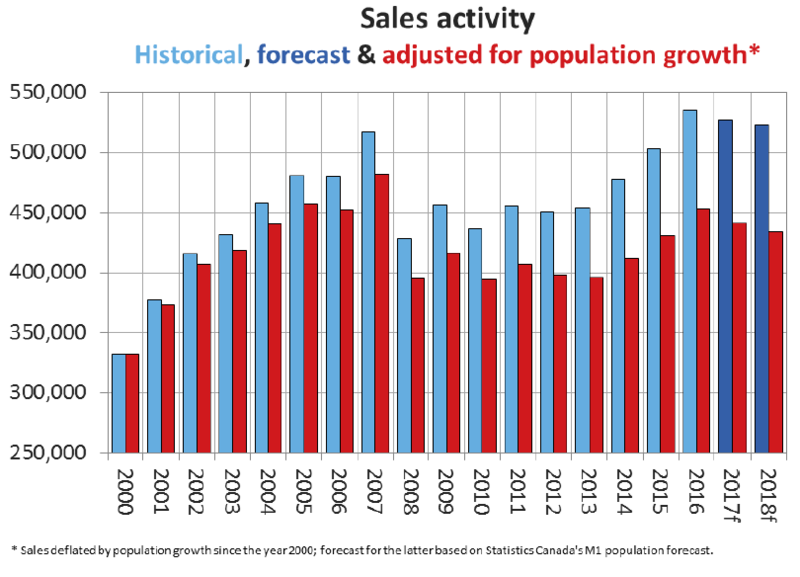 Newfoundland & Labrador is also forecast to see a sizeable decline in sales in 2017 (-11.7%), continuing a softening trend that stretches back nearly a decade. 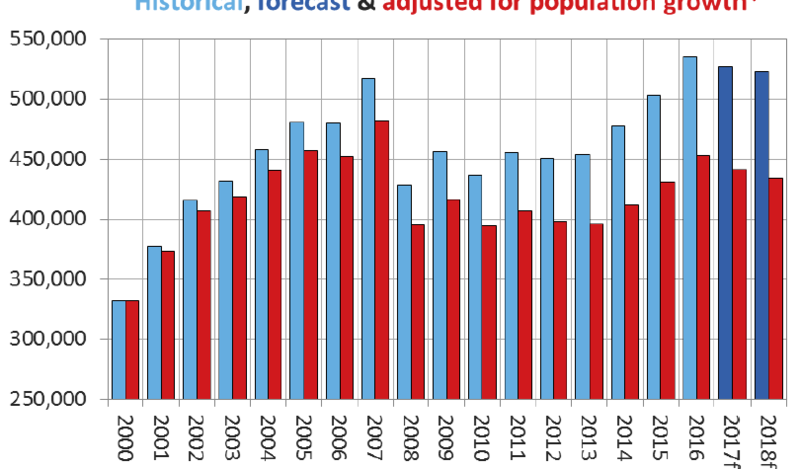 Smaller declines in activity are forecast for Saskatchewan (-4.4%), Ontario ( 2.1%) and Prince Edward Island ( 5.3%). Alberta is forecast to have the largest increase in activity in 2017 (+10.2%); however, this would still leave sales in the province below its 10-year average. Elsewhere, sales activity is forecast this year to be little changed from last year’s levels in Manitoba (+0.3%) and Nova Scotia (-0.4%), while activity in Quebec and New Brunswick is projected to increase modestly (+3.6% and +1.9%, respectively). The national average price is forecast to rise by 7.4% to $526,000 in 2017. 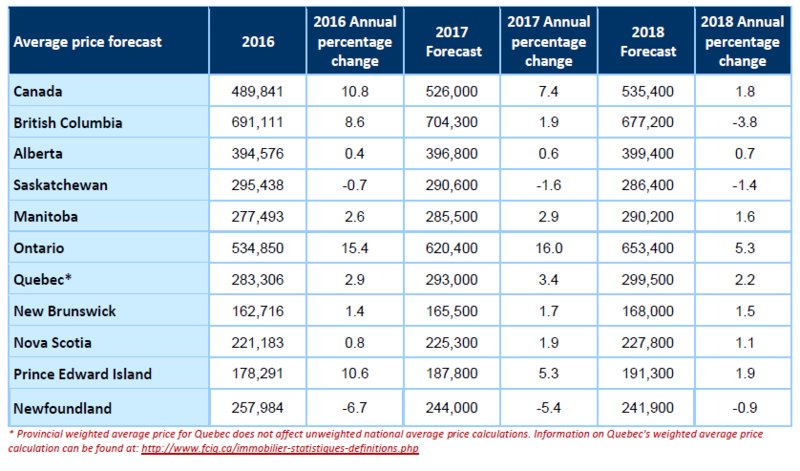 Ontario is forecast to post the only large average price gain in 2017 (+16%), which would nonetheless represent a moderation from where it is currently for the year-to-date. 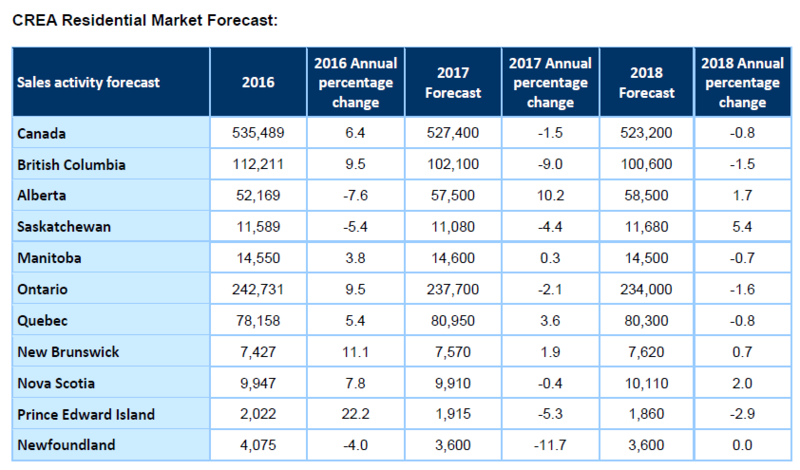 Only Newfoundland and Labrador (-5.4%) and Saskatchewan (-1.6%) are forecast to see average price declines in 2017, in line with historically elevated supply in those two provinces. Average price gains are forecast to be around the 2% to 3% range in most other provinces in 2017. In 2018, national sales are forecast to number 523,200 units, representing a decline of 0.8% compared to the 2017 forecast. Most of the annual decline is expected to result from fewer sales in British Columbia and Ontario following expected interest rate increases later in the year. The national average price is forecast to rise by 1.8% to $535,400 in 2018, with an expected gain of about 5% in Ontario balancing a decline of almost 4% in British Columbia. 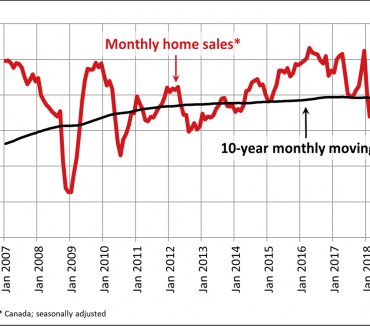 The forecast increase in Ontario reflects an expected calming of home buying sentiment and modest rebound in sales in the Greater Golden Horseshoe region. The expected decline in average price for British Columbia is also in part compositional, with Vancouver sales as a share of provincial activity likely to decline as mortgage interest rates rise. Saskatchewan and Newfoundland and Labrador are projected to see small average price declines in 2018, with home price increases elsewhere forecast to more or less track overall consumer price inflation in 2018.